Kevin MacDonald's scenic action-adventure landing on Blu-ray at the end of the month has now been fully detailed. 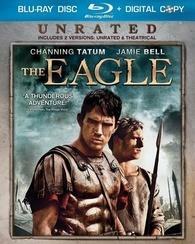 In an early announcement to retailers, Universal Studios is preparing 'The Eagle' for a Blu-ray release on June 21. The film stars Channing Tatum, Jamie Bell, and Donald Sutherland and follows a young Roman soldier determined to honor the memory of his father by seeking out the lost golden emblem of his legion. The Blu-ray will have both the theatrical (PG-13) and unrated cuts of the film in 1080p video, a DTS-HD Master Audio 5.1 soundtrack, and supplements include an audio commentary with director Kevin MacDonald, The Eagle: Making of a Roman Epic, deleted scenes, an alternate ending, and a digital copy. You can find the latest specs for 'The Eagle' linked from our Blu-ray Release Schedule, where it's indexed under June 21.